Many of you are probably already familiar with the groundbreaking channeled works by Jane Roberts in the 60’s and 70’s. For those that aren’t, I believe an introduction in order, for you have been missing out on some of the most astounding esoteric and deeply philosophic metaphysical works ever produced through channeling. In this post, we examine descriptions of the afterlife and our experiences directly after death through the perspective of one ‘old ghost’, who has admittedly been through it more times than even he could count. Channeling is a method by which a person (the channeler) goes into a trance-like state, and a psychological bridge is formed with a non-physical entity who then speaks through the channeler. The channeler is typically unaware of what is being said, and it will seem as though the non-physical personality is ‘in control’ although in reality, it is a partnership. In this case, Jane Roberts channeled an entity who calls himself ‘Seth’, and over two decades, wrote his own volumes of books about the afterlife, the nature of reality, science, health, personal improvement, consciousness, alternative history, and a host of other topics. The books are written from the perspective of a highly-evolved spirit who has lived many lifetimes and is no longer focused in physical reality. He returns through Jane as a teacher, to help us remember our spiritual heritage and empower us to make positive changes in our lives. 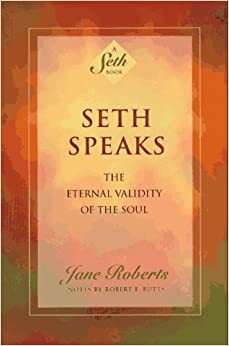 Jane Roberts, herself an author, devoted two sessions a week to Seth’s material, though by the time the books were finished, she had to read them for the first time like everyone else. She had no conscious memory of what had been spoken through her lips. Some people have divided opinions on channeling. I say, read “Seth Speaks: The Eternal Validity of the Soul” for yourself. The work is so astounding and so original for its time, that honestly, it doesn’t matter. Personally, however, I’ve looked deeply into the life and work of Jane Robert and her husband, Robert Butts (who was responsible for transcribing the channeled works) and have found absolutely no evidence or motive for fraud. Jane channeled unto her deathbed, and aside from the modest returns from her book, she led a more or less reclusive life, eschewing all fame, gaining no fortune and spending inordinate amount of time channeling for Seth. She and her husband lived in a modest apartment in Elmira, New York and only much later even had enough money to purchase a house. Clearly, Jane didn’t do this for glory or fortune, as she acquired neither, and yet the channeling continued. She produced many volumes of work, plus boxes of unpublished materials that are currently housed in the Yale library. She was also tested by a fair number of scientists and psychologists during the time, and all conceded there to be no evidence of fraud. Lastly, Jane, if producing these books under fraudulent claims, could have simply published the material under her own name, so why create a fictional entity? After spending decades researching Jane, reading the works, looking for any possible contradiction or motive for fraud. I have found none. In fact, to this day, The Seth Material remains the one afterlife source that I will proudly proclaim that I believe is genuine, and much of my personal belief system is colored by these works. When I first read them, they seemed to call up in me a sort of remembrance, and the ring of truth. So, without further ado, the best quotes on the afterlife by my favorite “old ghost”, Seth. Now, you may or may not be greeted by friends or relatives immediately following death. This is a personal matter, as always. Overall, you may be far more interested in people that you have known in past lives than those close to you in the present one, for example. Your true feeling toward relatives who are also dead will be known to you and to them. There is no hypocrisy. You do not pretend to love a parent who did little to earn your respect or love. Telepathy operates without distortion in this after-death period, so you must deal with the true relationships that exist between yourself and all relatives and friends who await you. You examine the fabric of the existence you have left, and you learn to understand how your experiences were the result of your own thoughts and emotions and how these affected others. Until this examination is through, you are not yet aware of the larger portions of your own identity. There are obviously as many kinds of ghosts and apparitions as there are people. They are as alert or as unalert to their situation as you are to your own. They are not fully focused in physical reality, however, either in personality or in form, and this is their main distinction. Some apparitions are thought-forms sent by survival personalities out of lingering deep anxiety. They portray the same compulsive-type behavior that can be seen in many instances in your ordinary experience. […] They are in themselves quite harmless. Only your interpretation of their actions can cause difficulties. Now in the middle of life, of life conditions, you also appear on occasion as ghosts in other levels of reality, where your “pseudoappearance” causes some comment and is the ground for many myths – and you are not even aware of this. The above descriptions are only a very small portion of the detail that Seth provides in his book, Seth Speaks: The Eternal Validity of the Soul. Although the material is difficult at times due to its technical, intellectual and esoteric nature, the sophistication of the material cannot be denied. It’s important to note that this book was written in 1970, before bookshelves were filled with books on spirituality; even before near-death experiences were first published into a book by Dr. Raymond Moody. This information predates most of the spiritual material that we now take for granted, and yet has formed the foundation for much of it. I would implore you to read the book in its entirety [or listen to the audiobook version] if you are interested in matters of consciousness, the afterlife and spirituality. I cannot promise that Seth will not challenge your preexisting ideas of religion or of divine judgement, as he denies both pretty early in his books. Instead, we create our own reality, and the only judge of our deeds is ourselves. Dogma has no permanent place in a realm of pure thought; and all experiences, both good and bad are judged as simply experiences; each with the potential for learning and growth. I am not too bashful to say that Seth changed my life when I first read it at 19. Now, nearly two decades later, re-reading his books only continue to deepen my spirituality. As it stands, most other afterlife resources that I consider of good standing don’t contradict Seth’s philosophies, they merely provide alternative examples of the same basic principals. The information found in the Seth material agrees with modern NDE experiences, after-death communications and information from genuine mediums and other valid channeling resources. It has served to validate and affirm my belief that our lives aren’t dictated by some God on high who doles out miracles and punishments in turn, but rather our experiences are of our own directing, for basic creativity of experience itself. Thank you! I’ve was delighted to find your prior readings on YouTube. Thank you for helping to share this wonderful material. You can do so much more then simply “believe” the works of Seth are “genuine” which even Seth himself encourages which is through astral projection. Through AP you can literrally experience the concepts/realitys Seth speaks about vs. simply believe they could be true. Then you know beyond doubt that what Seth speaks is actually true because you experienced what he spoke vs. believed what he spoke. AP is as natural as falling asleep. The phenomenon lies at the sleep/wake line. When you awaken in the morning or at night immediately relax your body as if you were going back to sleep but be sure to remain aware. Your body is close to the theta brainwave state which is where you want to consciously go to because usually we are asleep during theta. People have no idea how easy ap is to perform. There is nothing mystical about it and is a natural human ability that we all share. Most people dont even attempt to ap because they think only psychics or gifted people can do so which simply isnt true. Download michael radugas FREE pdf book “the phase” for quick tips and methods. Obes are the most mind blowing fun experience to have and i wish everybody would at least attempt to do so because with diligence everybody would succeed. Then Seths words come alive through experience rather then only belief. Have a great day! Thank you for your comment Richard. I agree. I think OBEs are the best way one can determine what they believe about their own spirituality. I’ve learned that we can visit the afterlife dimensions for ourselves, leaving no need for faith or belief. Problem is, honestly, I’m afraid. I was targeted once by a negative entity and I’m afraid if i start doing out of body work that I will become vulnerable. The fear shouldn’t stop me, I know that, but it’s something I’ve been thinking about a lot lately. How do I proceed spiritually if I’m afraid 9f the dark, so to speak? So your comment is timely. Do you have OBEs regularly? Agree wholeheartedly… Seth is profound. I would add that Seth Speaks was given to me before the age of ten along with Franz Bardon Initiation into Hermetics. Franz teaches to manipulate what Seth described. Jane herself suffered far too greatly.. When just accepting our imaginary nature could have eased much pain. Worry manifests and is our largest physical problem.. Distract from. Thanks for this article. I am now much older and Seth still cannot be improved upon.. I have never found a single point of contention. Not one. Not sure I agree with your comparison between Seth and Bardon as Bardon has many many desrepancys with Seth beginning with the soul and astral body are one in the same along with myriad other discrepancies. Bardon comes from a “mystical” aspect whereas Seth teaches natural abilities we all possess. To each his own. ” a six foot impressionist painting from two inches away.” Thank you. I have recently become sidetracked from the Seth material which has caused some confusion for me , especially becoming hung up and side-tracked on minor points. In my distractions i have never found anything to make me question the seth material. I will be returning to it as my main focus because the sheer volume and complexity of this information could take a lifetime to assimilate. And i am now personally satisfied as to its validity. Just recently found your website and i think it will be extremely beneficial to my journey. Thanks. I am well-acquainted with the thought of Seth, Jane Roberts, Buhlman and the rest of that crowd. I’ve been greatly influenced by the Journey and Destiny of Souls books and right now I’m reading the amazing books written by Jurgen Ziewe. But I have trouble integrating the visions of all these people in this respect — inner journeyers like Buhlman and Ziewe continually meet souls who have been stuck in one or another level of the afterlife for thousands of years due to the binding effect of their emotions; but Seth describes an afterlife that lights up almost immediately with awareness of the true situation and any hallucinatory periods are of quite limited duration.We have the same vision in the Journey and Destiny of Souls books. As I said, integration of these two visions/versions of the afterlife eludes me and I’d be interested in any thoughts anyone might have on this. I struggle with the exact same thing. It sounds like you are well-researched, and have come to the same perplexing conclusion that I did and have been thinking about for the least year or so. How is it possible to mesh all of these different ideas and descriptions of reality? I don’t have the ultimate answer, but there are a few factors that have helped me to make some sense of it, or at least, not throw up my hands and dismiss it all as bs. First, spirits and spiritual teachers are speaking from their own experience and knowledge. They often don’t agree, and their knowledge is not universal. Sometimes, they might even be wrong. The afterworld is vast and complex. The recently deceased, on the introductory earth-like planes will definitely not have the same experience as a higher level teacher. Secondly, my humble opinion, after researching for a long time, is that for certain experiences where visitation to the afterlife is temporary (NDEs, past-life regression, life-between-life and OBEs), the experience is highly subjective and in some ways – especially in the case of NDEs – curated. We are used to an absolute level of objectivity here on earth – but it seems to me that the afterlife dimensions are far more subjective experientially. Additionally, it seems that guides feel its better to work with what we already believe than to try and change our beliefs. This is why – I believe – NDEs are so personal and subjective. Christians see the perfect biblical Jesus and their NDEs have a lot of cliché religious elements. For them, it strengthens their faith and ultimately leads to living a better, more spiritual life. I believe, in a less obvious way, LBL and OBE experiences are similarly guided and curated. Newton says in his third hypnotherapy book that he stopped regressing people younger than 30 because ‘their guides didn’t allow them to see very much’. So there is evidence that the process is being carefully monitored and guided. People like Ziewe and Bulhman and Newton may see partial truths mixed with subjective experiences. Lastly, there is a huge amount of distortion between describing an experience in the non-physical dimensions and translating it to our experience here on earth. Rita Warren talks about this a lot in Frank DeMarco’s Rita’s World books, and how the real experience is not really translatable. Spirits in spiritualist literature are constantly complaining about how their words and meanings are being twisted by the biases of mediums. So, we have a ton of barriers to cross and the information we get, is at best, always a partial truth. That doesn’t mean it is not worthwhile to study these sources, however. There are truths and pieces of great wisdom that does translate, and you can learn to analyze the highly subjective experience of NDEs more easily by learning more about the person who is experiencing them. When you can subtract the influence of culture and religion, spiritual wisdom becomes more clear and over time you start to piece together a baseline set of truths. I have found that studying spiritual sources is like studying a 6-foot impressionist painting from two inches away. Our perspective on earth is very small, but if you spend enough time shaping the image in your mind from each small piece, slowly, the overall picture – though it will most definitely be imperfect – will begin to emerge. Don’t get discouraged. Spirituality is a life-long endeavor. Thanks for the thought-provoking comment – definitely something that occupies my own thoughts as well. It’s almost embarrassing to admit that I’ve only just discovered Seth! I’ve been interested in learning about outside of our physical world for 15 years and now listening to Esther Hicks channelling Abraham for a while having had the books for years. I discovered and downloaded Seth Speaks a few weeks ago and have just started listening to it and (maybe the opposite perspective to you as you had Seth 1st before others and then compared?) it resonated with me and confirmed everything I heard from the Abraham teachings. I highly suggest you research astral projection by reading William Buhlman etc and going to a forum called “astalpulse”. You neednt meditate to experience inner dimensional travel. Its as easy as falling asleep. Experience for yourself the multi dimensional reality we all possess. I kid you not. I can’t believe it – your introduction to Seth is nearly identical to mine! I was about 19 or 20 and I was in this old used book store operating out of this huge old home. I went to the occult section, and I saw ‘Seth Speaks’ sitting on top of one of the many piles of books. As you say, the cover isn’t particularly eye-catching, but something told me to pick it up. Like you, it changed my life forever too. Ideas only vaguely shaped in my mind were written out as clear, sophisticated philosophies. Reading it, I just knew it was true. It was like my world shifted somehow and suddenly I had a foundation for my spirituality. Seth’s words were so powerful and profound, it altered the way I viewed everything – for the better, I might add. I try to keep my enthusiasm for Seth from completely infecting my blog though because not everyone jives with it and surely spiritual diversity is a good thing. My family grew very tired of me saying, “Well, according to Seth…” I did branch out and have read many channelings, mediumship transcriptions, etc. and so far, nothing has really caused me to doubt Seth yet. Seth is still what I go to when I’m feeling uncertain in my life. Anyway, so glad to meet another fan who truly appreciates Seth’s philosophies. I do hope to introduce Seth to younger people as well – it’s a collection that should never be allowed to fade into obscurity. Thank you for your compliments on the blog. I hope to see you around. From the little i’ve read either you are channeling me or i am channeling you. Wonderful to encounter your work. Seth and Natalie Sudman so far. Are you aware of and read Robert Monroe’s second and third books? A kindred soul. I am so excited I clicked on your blog!! Like finding a kindred spirit in a sea of mass social hysteria (oops, I meant social media…no, not really)! I was looking for skeptical comments about the Channeling Erik website and then started reading your other articles. I love all of the Seth material. Came upon it in the late 80’s. Having all of the books on my shelf makes me feel like a friend is close by, a very powerfully knowledgeable friend. His words, through Jane Roberts, changed my life also. I have given Seth books to my daughter, my sisters, but it didn’t click with them. Of course, my parents and husband could not even be considered! So, I have plodded along on my own searching and seeking what is out there. It’s so nice to find kindred spirits! Yes, we are all on the same quest here – to find real spiritual knowledge without all the new-age hype or religious dogma. Just clear evidence-based spirituality that works and makes sense! I hope you visit often and share your experiences and recommendations with us as well!